Precision Turning and Manufacturing | Northland Screw Products, Inc.
We have the capabilities to meet your most demanding needs. When you need the best in quality manufactured products and service that lets you compete in today’s marketplace, call Northland Screw Products, Inc. The finest in CNC swiss turning, CNC milling and turning, manufactured components, and assemblies. Where Old World Craftsmanship meets Today’s Technology. Northland Screw Products is a second generation precision manufacturer, specializing in CNC turning, CNC swiss, screw machine, and CNC milling. Northland Screw Products is continually improving to exceed compliance with the highest customer standards. Northland Screw Products has an in-house tool making department to allow for faster, and more precise prototyping, and tighter tolerance control. Northland Screw Products, Inc. and its owners, Rob and James Martinson, were recently the featured Business Spotlight in The Courier, a local Minnesota community paper. 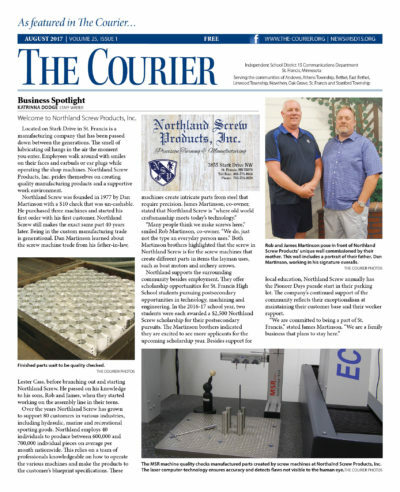 Click below to read the article online or download the PDF and learn more about how Northland Screw Products stays involved in the community!